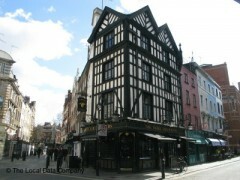 About: Our pub is so named from the dogs once used to hunt hares when Soho was open ground. Greek Street, on which we sit, dates to the 1670s and is named after the Greek Church that stood in Hog Lane. It is recorded that Casanova stayed in this street in 1764 and other records show the pub at this site in 1927, although licensed premises have existed here since at least 1847. Certified history dating back 1700's when the building was a coffee shop for the hunting grounds. What a great pub. Having had such a bad experience at the Dog & duck I found my way to this great little gem of a pub. The Landlady was very warm and welcoming and the ales here would match any other traditional pub. What a great experience. I will be reccomending to all my friends.